Hainan Airlines on Friday will adjust its summertime schedule so that its fleet of Boeing 787 Dreamliner jets can safely take off during the cool early morning hours, rather than run into difficulties often associated with the searing afternoon heat. Hainan Airlines found a way to beat the heat in Las Vegas. The Chinese carrier on Friday will adjust its summertime schedule so that its fleet of Boeing 787 Dreamliner jets can take off safely during the cool early morning hours rather than run into difficulties often associated with the searing afternoon heat, an airline spokesman said. 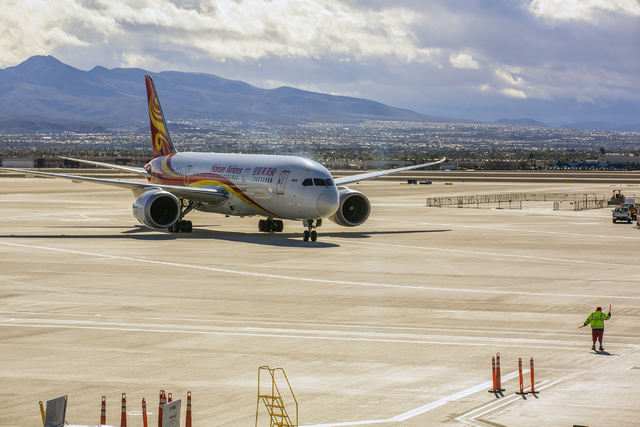 Beijing-bound flights will now depart at 1:10 a.m. from McCarran International Airport, rather than 2:10 p.m., said Joel Chusid, executive director of Hainan’s operations in the United States. The carrier will continue to arrive in Las Vegas at 12:10 p.m., three times a week. Hainan’s move comes after Norwegian Air Shuttle suspended flights aboard the twin-engine Dreamliner between Las Vegas to four European cities in late March, with plans to resume “seasonal service” in November. Both carriers reported problems taking off from McCarran International Airport during the afternoon, when temperatures exceed 100 degrees almost daily from June through September. Heat creates thin air, making it difficult to take off when large planes — like the Dreamliner — are filled with passengers, cargo and fuel during lengthy international flights. Hainan noticed that the high temperatures often meant the need to leave behind some cargo headed to China, resulting in hefty financial penalties, Chusid said. Passengers were not bumped from flights. The heat regularly led to hourslong delays for Norwegian Air Shuttle’s flights out of Las Vegas last year, prompting the carrier to suspend summer service this year. Norwegian’s issue stemmed from an unusually high passenger capacity of 291 seats aboard the Dreamliner, far beyond the average of 200 seats used by most airlines that operate the plane. Hainan’s version of the Dreamliner has either 213 seats or 289 seats, depending on its configuration. Hainan launched the first round of nonstop flights between Las Vegas and Beijing last December. Airline executives said they worked out the temporary scheduling change with McCarran, with plans to resume afternoon departures in October. 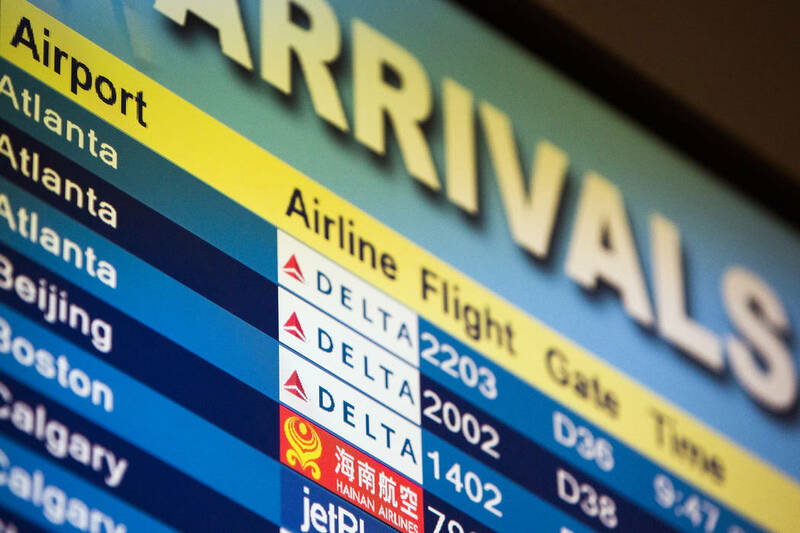 One advantage to the time change, airport officials said, is that passengers will be able to connect to 22 Chinese markets within three hours of arriving in Beijing. 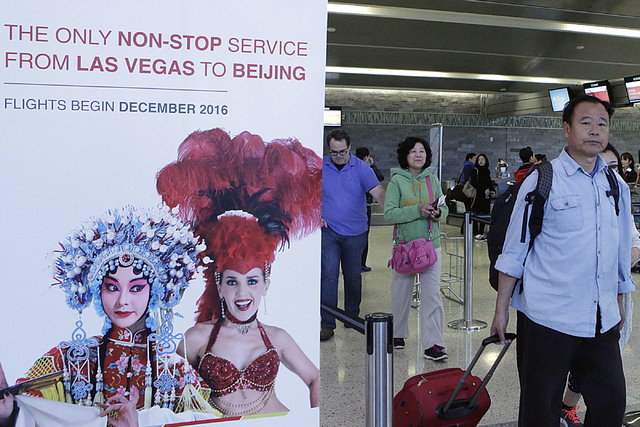 McCarran officials said they promise to keep the light on for travelers boarding those early morning flights headed to mainland China. Arrive Las Vegas: 12:10 p.m.